Pretty Parrot or Cute Cat? Before B and I decided to get a pet cat to begin our just-married adventure together, we talked about getting a fish. We wanted a pet we could both share like a lovely pair of goldfish. Fish seemed a tad too common however. Besides, what else can fish do besides swim and look pretty in the water? So we thought of birds next. It would be cool to have a parrot especially since they're known for their ability to "talk" by imitating human voices. We would have a lot of fun with a talking parrot and I know many pet stores actually sell these clever birds. Thanks to their sociable and affectionate nature, intelligence, bright colours and ability to imitate human voices, parrots make really popular pets. 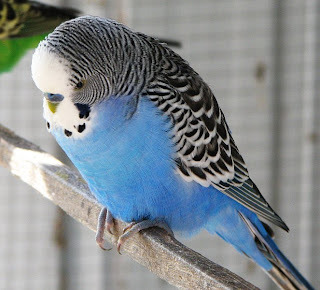 Did you know that the domesticated Budgerigar, which is a small parrot, is the most popular of all pet bird species? See how pretty? What's more, the types of parrot cages available nowadays almost convinced me to run out and immediately get a parrot! 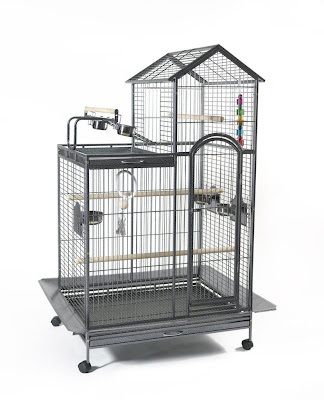 Check out this Liberta Two Tier Large Parrot Cage for instance. If I was a pet parrot, this is where I want to live. It's spacious, complete with a Playtop, 3 stainless steel feeding cups in the cage and has 3 swing-out feeding doors. There is also a seed catcher which makes for easy cleaning. Anyway, we were set on getting a bird as our first pet together but then B told me something, which changed our minds. He mentioned that he's always wanted a cat. As a boy he was not allowed to have a cat at home, so unlike me who already had so many cats previously, he was totally enticed and curious to start feeling and acting like a cat owner, which I thought was adorable! And that's how we ended up with three cute cats as our pets. The parrot was a great idea but it wasn't that practical for condo-living couples like us. Plus cats are more affectionate, adorable, self-cleaning, fluffy and they do make wonderful companions. Thank goodness we found Chubbs, Benji and Phoebe...in that order! heheh lucky tak kluar lagi.. it was raining just now and since we will have Awan with us, we decided to wait a while..
ok. off i go.. rain stopped. see you later.. hugs! All your cat pics are so cute and adorable! Great story of how you two decided on cats as your pet of choice! We had always two parakeets at home and Kareltje was always very sweet !!!! Nice pic of one of your cute cats. Glad you guys opted for cats insted. But the blue parrot look adorable. Actually, I love seeing birds too. Sorry I did not sooner. Last night I fell asleep with my LT on, trying and trying to drop EC but he line was poor, wasted too much time trying to drop EC, line extremelly slow .... was to fed up till tertidor!!! Even this morning struggling to get through !!! was so fed up ..
Lil, sorry to hear such news. Semoga ALLAH cucuri rahmat ke atas rohnya. "Al-Fatihah.."